UDM Downloads > Atoms, Bonding and Structure! Unique interactive multimedia Chemistry teaching software which tests students as they learn. Topics covered include: elements, compounds, mixtures, structure of materials, bond energies and the Periodic Table. 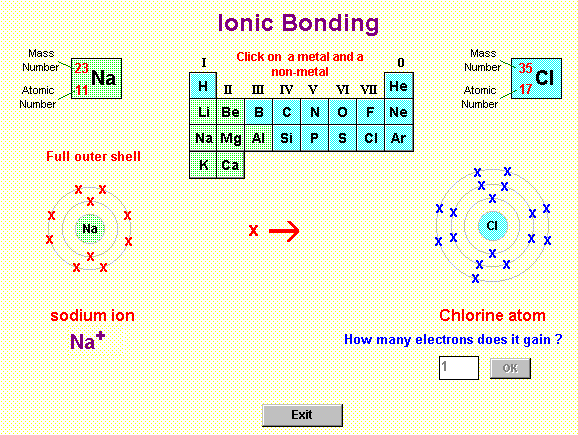 Plus interactive simulations to teach atomic structure, ionic bonding and covalent bonding. As far as possible, skills are taught through familiar examples, to help reinforce general chemical knowledge. Written for use in schools, but an excellent personal tutor for anyone beginning to study Chemistry. Questions constantly test understanding and hints are given when answers are wrong.